Southern Indiana Scuba has been selling only the best diving products on the internet since 1998 and has been in operation as a Dive Center since 1975. We pride ourselves on outstanding customer service. We offer the latest in the Professional Cylinder Inspector products and training, SSI Training, PADI Materials, ScubaPro Equipment. We are always adding to our website to better serve our customers and the dive community! 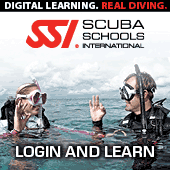 In addition to our great variety of high quality dive products, Southern Indiana Scuba is a SSI Dive Center. We offer training and classes for all levels of diving. Our professional and knowledgeable staff of Instructors, Assistant Instructors, Dive masters, Travel Consultants, and Sales Staff can assist you the entire step of the way to meet your diving goals and get the most out of diving! Have Underwater Photos and want them to look their best. This is the newest software for those who want to improve the photos but don't know how and don't want spend BIG buck. $49.99 for FULL version or Trial Version for FREE. While we hope you’ll return from every dive without a problem, the ScubaDiverTag will ensure you have your critical information with you at all times. We have noticed many dive operations do not collect your DAN or emergency contact information. The ScubaDiverTag has all those details and more. Once attached to your BCD, you will never go diving without it! Id books in PDF format Take these great books on your next dive vacation in your tablet or phone.